With the wind blowing out, the Liberal Bee Jays took advantage. Liberal homered four times and pounded an out matched West Texas Outlaw team 16-1 Saturday night at Brent Gould Field. The Outlaws helped the BJ cause with six errors. The BJ’s scored four in the first, two in the fourth, one in the fifth, six in the sixth including three homers, and three in the seventh. During that sixth inning, Chandler-Gilbert’s Aaron Mees hit his second homer of the season, Seward’s Kelby Tomlinson went deep for the first time this season, and Rhode Island’s Kyle Borden hit a shot over the center field wall for his third homer. College of Sequoias Joe Perez hit his third homer of the season during the seventh. Tomlinson and Perez were 3-4 while Perez drove home three runs. Mees was 2-4 with four RBI’s while Borden and Nicholls State’s Sam Konnoff collected two hits a piece. Angelina College’s Austin Robson improved to 2-0 pitching six innings allowing one run while striking out three. 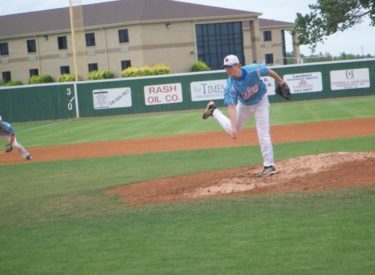 Louisiana Tech’s Will Alvis pitched two scoreless innings before Concordia’s Matt Gelormino pitched a scoreless ninth. The Bee Jays are 15-6 overall and the Outlaws from Amarillo are 11-3. The Bee Jays host the Dodge City A’s for the 4th of July game tonight at 7 p.m. on Talkradio 1270, kscbnews.net, and Windjammer Cable channel 8. First Southern Baptist Church will put on a picnic from 4-6 p.m. After the game, there will be a video montage with interviews from local veterans. The fireworks will follow the montage. The fireworks and the buyout are brought to the fans by Pizza Hut, the Community Bank, and the City of Liberal.